Korean BBQ beef, bulgogi, is very easy to make at home with a few basic ingredients, and the thinly sliced beef doesn’t take long to marinate. 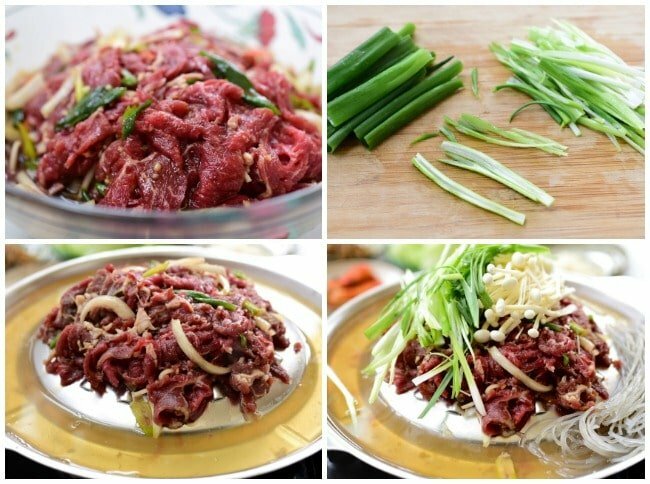 Here’s everything you need to know about how to make the best bulgogi! This recipe also shows how to enjoy it Seoul style. Bulgogi (불고기), also known as Korean BBQ beef, is marinated thinly sliced beef. 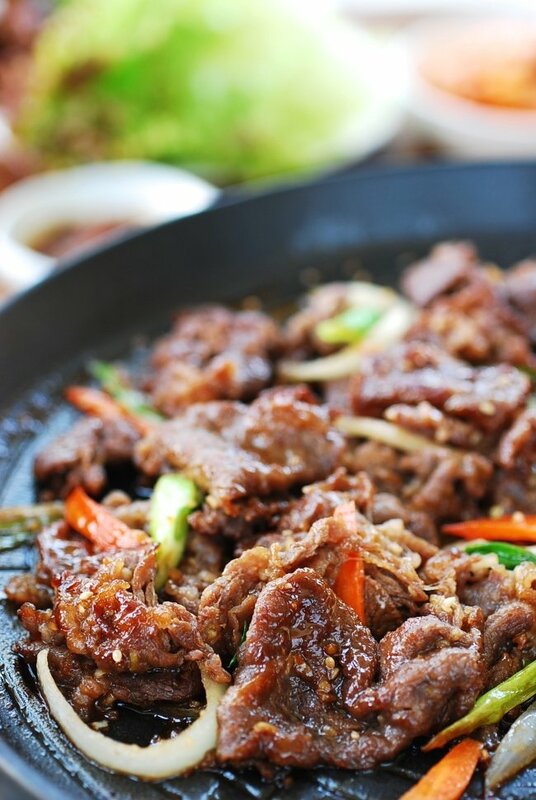 While it can be made with other meats such as chicken (dak bulgogi) and pork (dweji bulgogi), the term “bulgogi” generally refers to beef bulgogi. While this Korean marinated beef is most commonly char grilled at restaurants and homes, especially outside Korea, there are many regional variations of how this dish is prepared. 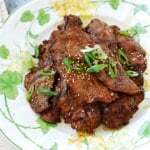 This Korean BBQ beef recipe was originally posted in May 2010. In this updated post, I’ve made minor tweaks to the recipe and introduced Seoul-style bulgogi (서울식 불고기), which is how I used to eat bulgogi growing up. Over the last decade or so, it has made a remarkable comeback and become very popular throughout the country. My family loves it! So, I decided to share it with you too. The best cut of meat for this dish is rib eye. Any tender, flavorful cut of beef, such as sirloin and tenderloin, works well too. I sometimes use tenderloin when I cook for the elderly members of my family and friends. 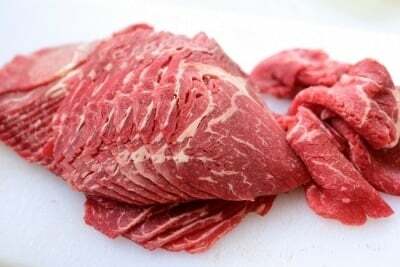 You can find pre-cut bulgogi meat at Korean markets. It usually comes in different grades. Spend a little more for good quality meat if you can. You can also ask your butcher to thinly slice the meat or slice it yourself after freezing the meat for a couple of hours. The classic marinade or sauce is made with a few basic ingredients such as soy sauce, rice wine, sugar, sesame oil, garlic, etc. The important thing is to find the right balance between saltiness and sweetness. Using generous amounts of garlic and sesame oil is necessary to create an authentic taste. To enhance the flavor and tenderize the meat, Koreans traditionally add a grated Korean pear to the marinade. If you cannot find a Korean/Asian pear, you can omit it or use an apple instead. Thinly-sliced good quality meat doesn’t need much tenderizing. If desired, you may also use kiwi or pineapple, but be sure to use only a small amount so you don’t over-marinate the meat. They are very strong tenderizing agents and can break down the meat too much. 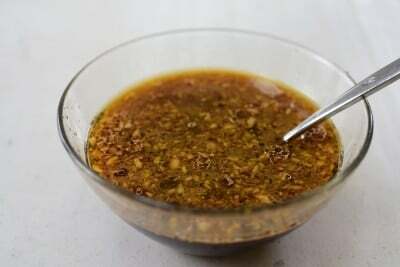 This marinade can also be used for other meats such as chicken or pork. The thinly sliced meat doesn’t take hours to marinate. 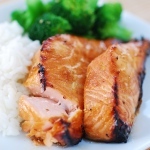 All you need is about 30 minutes to an hour, although you can marinate it up to overnight. Grilling: You can grill the meat over charcoal or wood charcoal (sootbul, 숯불), but a gas grill or a grill pan over the stove top works well too. If you are pan-frying your bulgogi and want nicely caramelized meat, preheat the pan nice and hot and don’t crowd the pan. 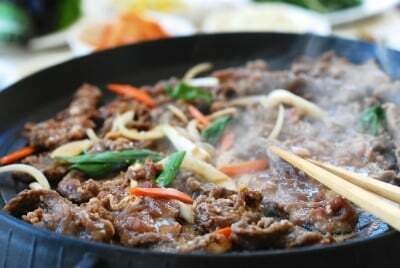 Stir-frying: Koreans also cook bulgogi in its own juice in a pan over the stove top for softer meat and some delicious sauce. Use all the marinade if you want more sauce at the end. As I mentioned earlier, this is how I grew up eating bulgogi, which has revived and become very popular. 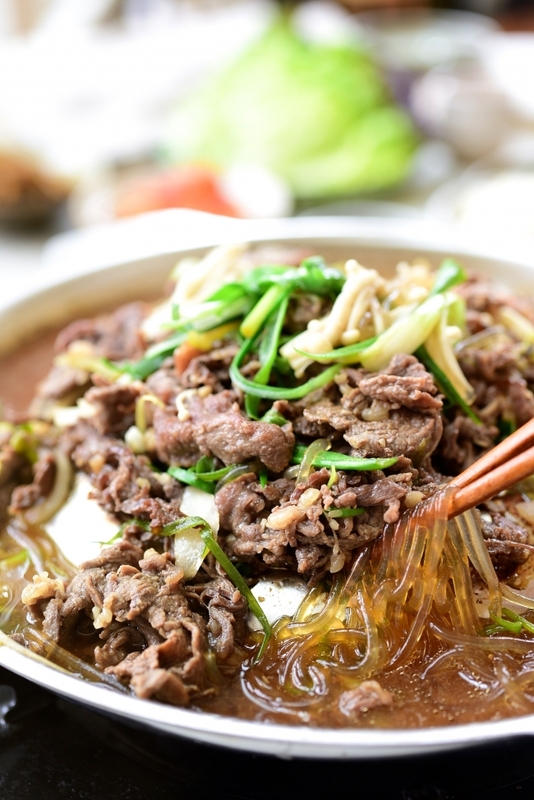 This style of bulgogi is also known as yetnal bulgogi (옛날불고기), meaning old-fashioned or old-school bulgogi. The meat is cooked on a special dome shaped pan with holes and a flat bottom that holds water or broth. 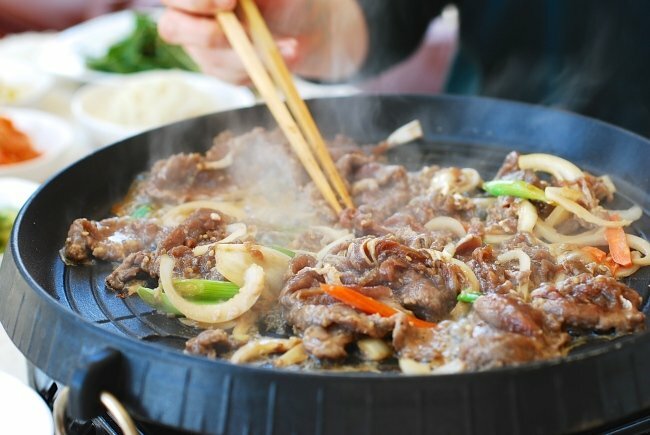 The dome shape allows bulgogi drippings to flow down to the water or broth, which thickens as the meat cooks. Starch noodles and/or vegetables such as mushrooms are delicious cooked in the slightly sweet and savory sauce. Try mixing the sauce with your rice. Incredibly tasty! The liquid can be simply water or broth. I use dashima broth that’s mildly seasoned with some soy sauce. I found my dome-shaped grill pan at a local Korean market, but I also saw it online if you’d like to buy one. Otherwise, simply use a large skillet instead. Pa muchim (scallion salad) is excellent to accompany this dish along with lettuce wraps and ssamjang. For other vegetable side dishes, see my 15 Korean vegetable side dishes. Doenjang jjigae (soybean paste stew) pairs very well with bulgogi too. Leftover bulgogi is excellent in bibimbap, gimbap (also spelled kimbap), bulgogi doepbap or bulgogi jeongol. 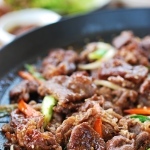 Have you tried this Korean BBQ beef recipe? Please rate the recipe below by either clicking the stars or leaving a comment! And make sure to share your creations by tagging me on Instagram! Stay in touch by following me on Pinterest, Twitter, Facebook, and Instagram. This Korean BBQ beef is very easy to make at home. 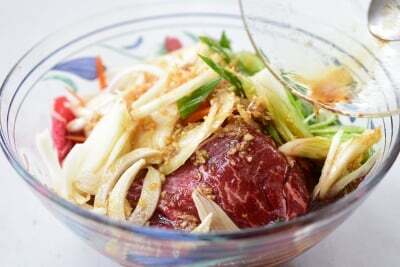 The marinade is made with a few basic ingredients, and the thinly sliced beef doesn’t take long to marinate and cook. If using packaged pre-sliced meat, separate the slices. Remove any excess blood from the pre-sliced meat using paper towels. Place the meat and vegetables in a large bowl. Add the marinade and toss gently to combine everything well. Marinate the meat for 30 minutes to an hour, up to overnight. 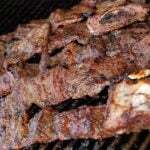 Grilling: Grill the meat on a charcoal or gas grill or pan fry in a skillet over high heat until slightly caramelized. If pan searing, preheat the pan nice and hot and cook the meat until slightly caramelized. Do not crowd the skillet. OR Stir-frying: Preheat the pan, and add the meat over high meat. You can crowd the pan to generate some liquid and let the meat cook in its own juice. Cook until the meat is no longer pink. Use all the marinade if you want some sauce at the end. Thinly slice the scallions. Season 2 cups of water or broth with 1 teaspoon of soy sauce. Heat the pan, and add the bulgogi and top it with the scallions and mushrooms. Add about half of the broth around the edges of the pan. Add more when the liquid level goes down as you cook. *Pre-sliced bulgogi meat is sold at any Korean market. Pay a little more to get good quality meat. If cutting the beef at home, partially freeze for about an hour to firm it up for easier slicing. Cut across the grain into about 1/8-inch thick slices. How’s my Korean?? Hahaha. 1 month and 7 days before I’m off to Seoul. I’m actually making bulgogi too this weekend. I use some walnut and cornsyrup too. Wonder if that’s usual? My mum never taught me how to cook it, I just try out different recipes and make my own. Your Korean is impressive! Walnut and cornsyrup sound good. Cornsyrup is used by some people, just like I use some honey in mine. Enjoy your bulgogi! 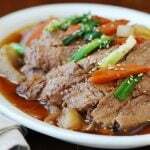 Thank you for sharing this wonderful Korean BBQ Beef recipe. I love Korean BBQ. Korean BBQ is so popular in both Taiwan and China but since I moved to UK I have no chance to have Korean BBQ in my life. I will certainly try this recipe in the future and thanks again to sharing this life saver recipe lol. I love bulgogi! 🙂 its definitely my favorite korean food!!!! Made it tonight and it was fantastic! Thanks! Oh I’m so happy to hear that! Thank you for letting me know! I am so happy to have found this recipe. Mt best friend in the US served us galbi and bulgogi all the time and I loved it. I am living in France now and craving Korean food so I will definitely try this soon. Now if I can just get my butcher here to understand what I want him to give me! p.s. I remember my friend used kiwi as a meat tenderizer (I am guessing in place of the Asian pear), but warned me not to let the meat soak in it for more than 30 minutes. Stephanie – Welcome to my blog! If you’re using good quality and thinly sliced meat, kiwi is not recommended. It tends to break down the meat too much. The effect is really not the same as Asian pear. If using it, make sure you use a very small amount. Hope this helps. Happy cooking! Thanks 🙂 I just made this recipe again and it was great. My whole family loves it. I will try it with chicken next. I just made this for the second time in a month and it was delicious! Thanks so much. I just made bulgogi for the first time last week. I think it was too sweet though. I will try this recipe next. Thanks for sharing! Thank you so much for your recipes. I moved away from Atlanta to Brunswick, Ga a few years ago and there are no korean restraunts here 🙁 I was constantly calling my mom but her measurments (along with every other female in my family) is a pinch of this or just little bit of that so things tend to come out a little iffy when I try on my own. I wish I paid more attention growing up but now I can just look on your site for great recipes! Thank you again. Oh I was just there in Brunswick last week for work. Where do you get Korean ingredients there? I’m very happy to hear my recipes can help you recreate the food you grew up with. I look forward to hearing more about your Korean cooking. Thank you for visiting and leaving me the kind comments! Love Korean food!!! I will trying this recipe soon. thank you!! Great! You’ll like it. Thanks for coming by. Awww that’s so nice to hear! You just made my day. Thank you so much!! And Happy Holidays! This is recipe is simply amazing.Thank you so much for your recipes. They’re easy to follow and the taste is unbelievable. You’re welcome! And I’m sorry I just post your comment. I had missed it. Thanks for trying it out and letting me know how it turned out for you. Thank you foo this recipe! 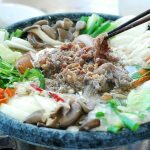 Just a quick question – how long can I keep bulgogi frozen for? Should be fine for a couple of months. Thanks! Hello! I have a really random question. My daughter is a very picky eater and I need to get some meat into her. She showed some interest in ground beef but being Korean, I’m not sure what Korean dishes include the use of ground beef. Anyway, do you think this recipe might work using ground beef rather than sirloin? I love your recipes and I love how clear your directions are. It should work with ground beef. Cut the recipe in half and try it. Or fried rice with ground beef? Gimbap? Add cooked ground beef to gyeran mari? Or tangsuyuk? Kids usually love that. If she doesn’t like the sauce, skip it. Hope you find something she likes. Thank you so much for your love! Hello, we’ve recently moved to Korea and I’m looking for Rice Wine at the local market. In Korean, should I ask for “Cheongju”? Is that different from Makgeolli? Thank you! You should ask for “cheongju.” “mirim” is okay too. The latter is slightly sweetened. Good luck with your new life in Korea! And yes, cheongju is different from makgeolli. Cheongju is clear liquid, and makgeolli is milky. Thank you so much! I’m enjoying working my way through your recipes. You’re welcome! Let me know how things go as you go along. Happy Korean cooking! I LOVE bulgogi. It was a favorite food when I visited Korea. (For some reason, I also loved those simple little fish shaped pastries I got at the train station.) I just got some sirloin to make some. I want to know how a Korean bapsang has time to make the banchan ( the kimchi is obviously made already). Do you do it ahead of time? Bungeobbang! Red beans inside right? I love them too. Well what you see there are kongnamul (soybean spouts) and mu namul (radish), which are pretty quick to whip up and they last 2 to 3 days for me. Of course I always have kimchi. Oh there’s a dandelion salad too, which was also very quick to put together. I usually make some on weekends so we can have during weeknights. And on weeknights, I add a dish or two I can prepare quickly. However it wouldn’t take my visa debit card and everything was correct! hmmm I don’t have video/cookbook sale on my website. Hi Diego – I am so happy to hear you and your family like my cooking style! Thank you, and send my regards to your wife. I think it has to do with how you cook it. For this recipe, I cooked it over high heat until the liquid is gone and the meat is slightly caramelized. Cheers! I love your food. Everything I have made from here has been DELICIOUS!! I am having 12 people over tomorrow and I am making Bulgogi for the first time ever. I can’t wait!! Thanks for sharing all your amazing recipes with us! My dad just picked this beef eye round thinly sliced from the store and I had no idea how to cook it. Thank you so much for sharing! You’re welcome, Daria! Hope you enjoyed it! What else would you serve this with for a full dinner ? Thank you so much for this recipe. It brings back many memories when I was a Peace Corps Volunteer (Pyeong Wha Pong Sa Dan Won) from 1975-77 in Namwon Jeonra Buk Do. Sometime all the teachers at Namweon Boys Middle School would drop by a Kalbi Restaurant or a Bulgogi Chip and have some delicious meat. I really had never experienced such an exquisite dish at that time. I think that I will prepare some myself later in the summer. Thanks for letting me know and reminding me about this wonderful dish. It seems very easy to make. I love bulgogi and couldn’t wait to try this recipe. I followed the instructions carefully and grilled the meat. It came out a bit dry. Did grilling make it so dry? Any suggestions? Hi Kim – Sorry for the late reply. I was traveling for a week, and lost track of email notifications for a while. It’s possible. Grilling thinly sliced meat over open fire can dry the meat. If you do, try grilling briefly until the meat still slightly pink. Also, the meat could have been tough to begin with. Pay a little more to buy high quality meat. Hope this helps. What do you serve it over? 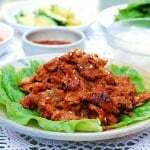 Usually served with rice, side dishes and lettuce wraps, but you can eat it any way you want. Enjoy! What do I serve it over… Rice? Ha ha that’s funny what she said about your brown rice! I’m happy to hear your mother approved it. The best judge always is our mother! Thanks for stopping by with the happy notes! I just wanted to tell you thank you so much for the recipe! I will make the bulgogi this weekend. I was trying your spicy bbq bulgogi recipe the other day and it tastes so much like the restaurants I went to in Korea! my cooking level is up no because of your recipe, and my family loved it too! Thank you for the tasty recipe. Asian pears were out of season, so we used grated sweet onion and it was really good. 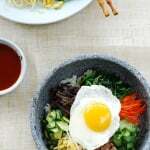 Getting married next month to a soldier who loves korean food so I have been all over your website! This bulgogi recipe was so easy to follow and a big hit with my parents so hopefully my soon-to-be husband likes it too! p.s. my Korean neighbor recommended adding a can of coke to the marinade instead of honey/sugar, and it tenderized a cheaper cut of beef beautifully! Congrats on your getting married! And thank you for checking out my website. Yes, coke works. Delicious. Made it using chicken in a standard pan. Added the pre-boiled noodles at the end. Served with rice and kimchi. Easy lunch for the family. Thank you for sharing your recipe.